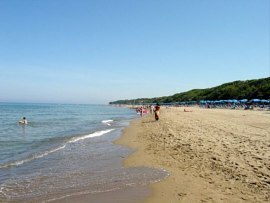 A coastal town on the shores of the Thyrranean sea, is one of the best equipped touristic centers of the Etruscan Coast. 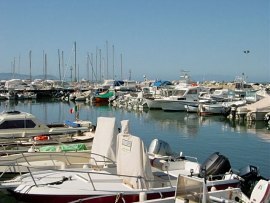 To has an excellent harbour with more than three hundred spaces for boats and it has the biggest accommodation capacity of all the Val di Cornia and the Etruscan Coast. Its beach of fine white sand runs for ten kilometers and is surrounded by thick Mediterranean woods that reach directly to the sea. It can be easily reached by car and by train (from the Rosignano exit of the A12 motor way with the Aurelia highway and with the through trains and lnterCity trains of the FF.SS. (Italian Railroads) line Modane -Turin -Genova -Pisa -Rome), and the "G. Galilei" International Airport of Pisa is only 60 kilometers away. San Vincenzo has all the public services and facilities needed. It is very near to the promontory of Populonia and to the center of an important Etruscan archeological area. lt is only a few kilometers away from old villages and medieval towns such as Suvereto, Sassetta, Campiglia Marittima, Bolgheri, Catagneto Carducci, Volterra, San Gimignano and Siena. Pisa and Florence are also just around the corner San Vincenzo is also a few minutes away from the island of Elba and is in front of the island of Capraia. From the harbour depart tours on sea routes of very interesting landscapes. This town is very well equipped for sports and free time, and gives the tourists the chance of doing all sorts of activities.